Compared to drawing or painting, block printing is more of a mystery to those of us who aren’t professional artists. Most of us didn’t practice it in school (though my mom tells me she did in Japan in the ‘60s), it requires a new set of tools up-front, and even its most basic principle — carving away negative space around an image rather than drawing the image itself — sounds esoteric and advanced, or at least it did to me. I’d wanted to try printing with a block for years, after taking a potato-printing class at my local community college, but I waited for all these reasons. And then one day I came into the HelloGiggles office to find a copy of Print, Pattern, Sew on my desk. I recognized Jen Hewett immediately from Instagram, where I’d been following her for her prints, often floral and playfully abstract. Alongside her work, her students’ work, and photos of her Italian greyhound mix, Gus, she also posts occasional photos of her mixed-race family, her dad black and her mom Filipina, and has spoken out about America’s racist and xenophobic policies, the implications of which are not at all abstract to her. “I’m only, what, four generations removed from slavery?” she told me after the event. “My mother came to the country on a tourist visa and then marshal law was declared in the Philippines, so she had to scramble to convert that tourist visa to something else. Immigration is much tougher than people think.” Hewett grew up in Country Club Park, a neighborhood of Los Angeles where her family lived among mostly black and mixed-race families. Because of their mom’s strong Catholic background, however, she and her brother attended Catholic school, where they were the only black students, taught mostly by nuns who had never worked with children of color before. Catholicism and Filipino culture are closely intertwined. In the Philippines, more than 80 percent of people identify as Catholic, as do 65 percent of Filipino Americans, according to the Pew Research Center’s latest data. Hewett’s dad grew up Protestant, going to a predominantly black church, but he didn’t insist that his kids do the same. “That was one argument he was not going to have with my mom,” she said. “It was untouchable, and I think that was part of the agreement when they got married, too, that we would be raised Catholic.” Later, Hewett learned from friends that the black church was the place where they found community, where they felt comfortable and loved, which was not how church felt to her. Mid-way through the demonstration at Blick, Hewett’s parents walked in the door together. Her dad, who retired as a photographer for UCLA, walked around the perimeter of the crowd, snapping photos. Soon, the shop was full of her loved ones: her brother, several of her friends, most of them artists, and many wearing handmade clothes or jewelry. 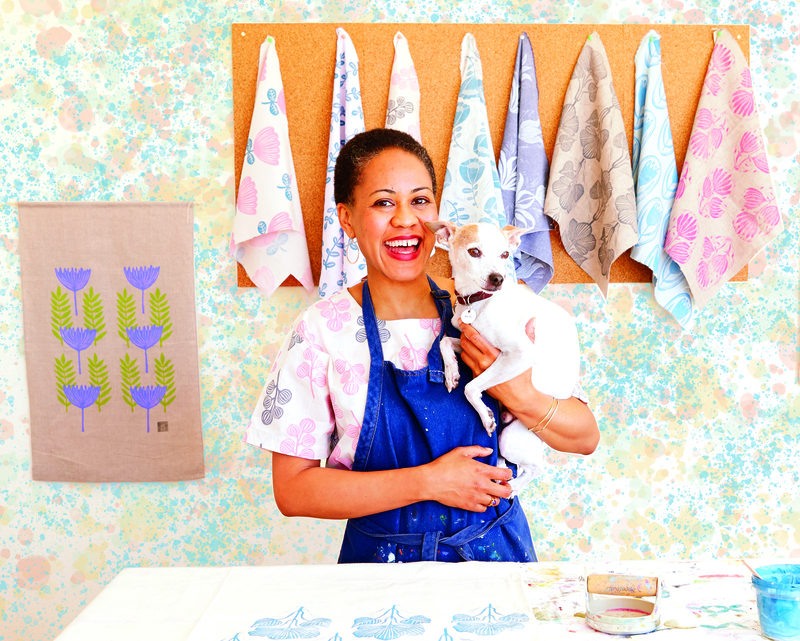 Rosemary Dardick and Robin Belcher, the artists behind paper goods company Ink + Smog Editions, came with their smiley three-year-old daughter, who is also mixed, and whom Hewett adopted as her assistant just in time to press the blue-inked crocus block onto a piece of white fabric. The child of printmakers knew what to do. 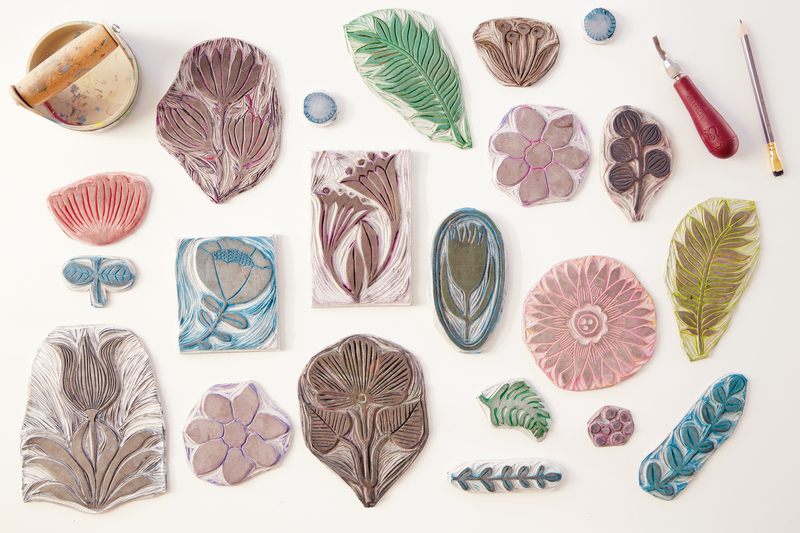 Hewett now makes a living through a range of related businesses: teaching printmaking classes, selling hand-printed goods, licensing her designs, and more. Keeping her workload diverse relieves pressure to chase trends in her designs. Her parents, who worried that being an artist was synonymous with always struggling for money, are beginning to see that she’s making it work. Her first fabric collection, Imagined Landscapes, comes out with Cotton + Steel Fabrics this fall. 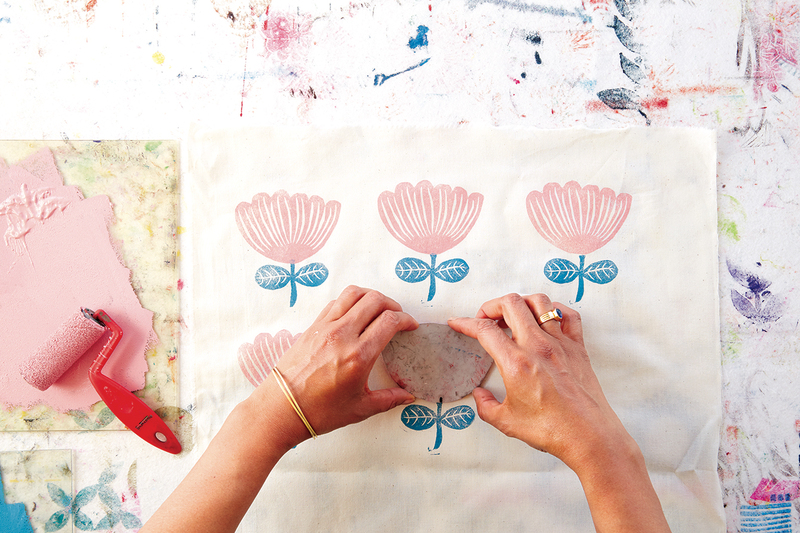 Print, Pattern, Sew, which came out in May, is a beginner’s course in block printing that also includes patterns for 13 sewing projects, ranging from simple scarves to dresses and espadrilles. 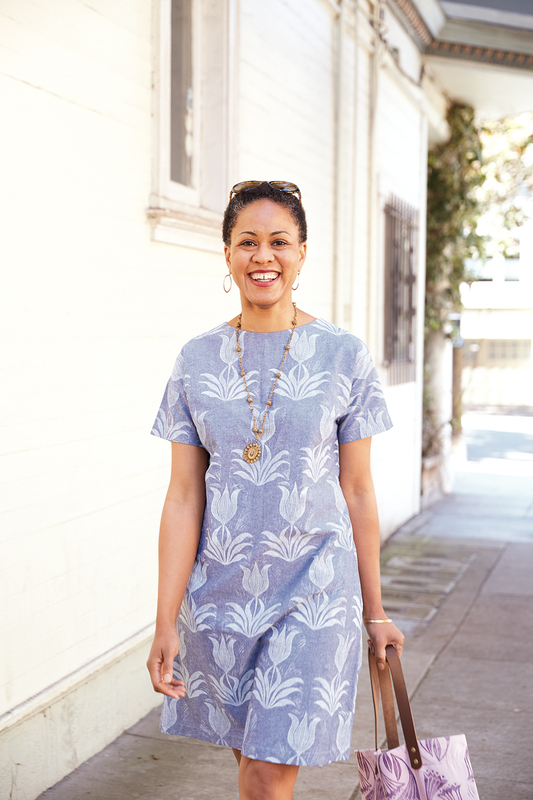 The book grew out of a personal challenge Hewett set for herself in 2015: Each month, she used her hand-printed fabric to make a garment, then shared it on her blog. 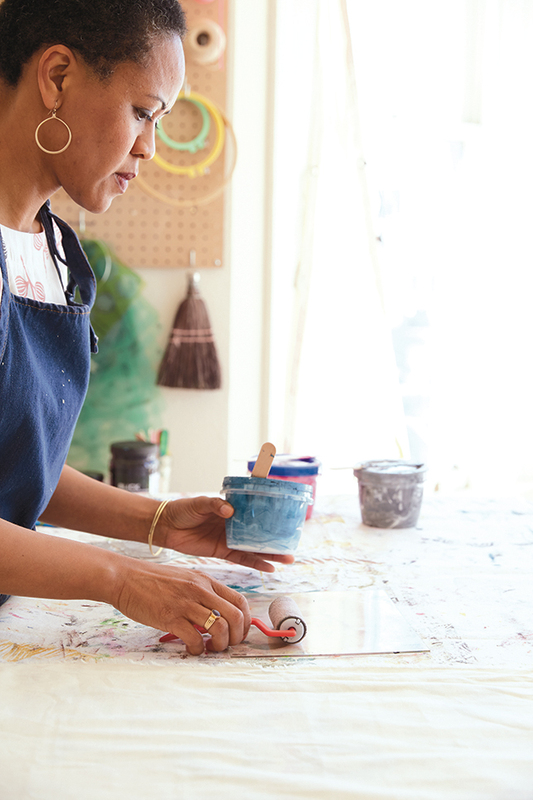 The year before, she’d done a challenge called 52 Weeks of Printmaking, in which she created a new print each week, and in 2017, she did 52 Weeks of Printmakers, highlighting fellow artists through Q&A-style interviews. The point of these challenges was for Hewett to approach her craft with the kind of ease we saw at her demonstration, to cut away time for perfectionism and just do the work, quickly and consistently. Whether it turned out well or badly, she had to keep moving. This spirit suffuses her book, through multiple notes about working with or around mistakes. It shows up in her designs, too, many of which incorporate intentional carving lines outside the main images. The texture suggests movement, a beautiful imperfection, a happy vibrancy. Print, Pattern, Sew: Block-Printing Basics and Simple Sewing Projects (Roost Books) is available now at Amazon, IndieBound, and more. You can find Jen Hewett on Instagram @jenhewett. Images from Print, Pattern, Sew © 2018 by Jen Hewett. Photographs © 2018 by Jen Siska. Reprinted in arrangement with Roost Books, an imprint of Shambhala Publications, Inc.